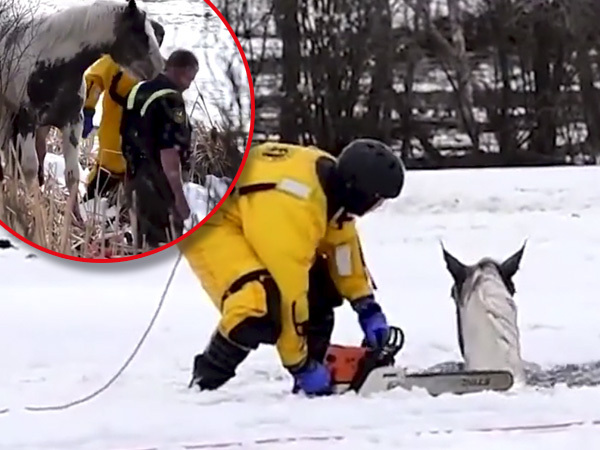 Rescuers had to use chainsaws to cut the poor animals free. Ten horses found themselves trapped after walking across a frozen dam on Sunday, amidst icy weather conditions. The incident took place about 65 km to the west of Grand Prairie in Canada. According to Edmonton News, it wasn’t solely the harsh weather that complicated the task at hand; the risk of injury to the rescue teams was also great. To make matters worse, it wasn’t docile, domestic horses that were trapped, but wild horses – broncos – that are usually used for rodeo purposes. Trevor Grant, head of Grande Prairie's regional fire service, described it as one of the most difficult operations his team has ever been tasked with. Seven of the steeds survived, but three of the animals didn't make it -- two died due from exhaustion, while another passed away from injuries sustained during the traumatic ordeal.